It’s the season of the squeeze. That should require absolutely no explanation, but just in case: Picture thousands of stressed-out holiday travelers in airport terminals, train stations and bus terminals, bundled up in winter clothing, all piling into a claustrophobia-inducing cattle-class cabin. It can lead to chaos. What better time to brush up on your luggage etiquette? It starts with what you bring. 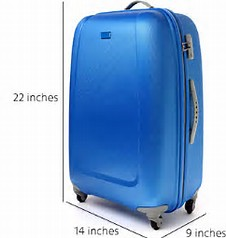 “Consumers are looking for the most possible space and lightest-weight case possible,” says Scott Niekelski, a direct import manager at the National Luggage Dealers Association, a luggage distributor. airline on which you are flying. That may be the wrong impulse. When it comes to proper luggage etiquette — less is more. 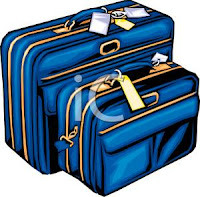 The most experienced passengers travel light. Some don’t bring any luggage. Realistically, most of us travel with at least a backpack, purse or some other kind of carry-on. On planes, carry-on luggage is a never-ending irritant. 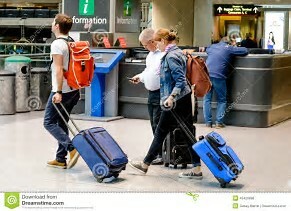 Airlines are partly to blame, since checked luggage fees incentivize passengers to carry most of their belongings with them. 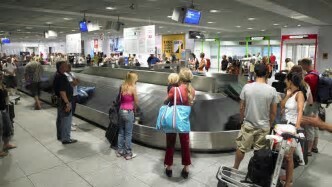 Protocol experts say the key to avoiding scraps over luggage is packing light and moving fast. Downsize to a smaller carry-on, like a 22-inch rollaboard or a backpack, and place it in the bin above your seat — not someone else’s (that’s called bin-hogging, and it will almost certainly annoy the passengers below). No one likes a blocker, and that’s true at the luggage carousel, as well. For some reason, passengers feel they own the spot immediately next to the conveyor belt, and they refuse to give it up, even if other people see their luggage and want to collect it. Be kind and patient when waiting at luggage carousels. Backpacks are another source of pain for travelers, and that’s true on any mode of transportation with narrow corridors. During boarding and deplaning, it’s easy to turn quickly and unwittingly hit fellow passengers with them. 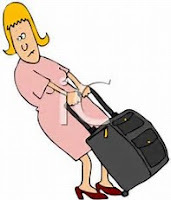 “Take bags off of your shoulder, especially backpacks, before walking down the plane aisle,” says Sarah Howell, a corporate trainer and frequent business traveler based in Austin. A special note about kids: Parents, if you can avoid taking a stroller, do. Strollers are clunky and they’re easily damaged when you gate-check them. Also monitor older kids with luggage. Christopher Elliott's latest book is “How To Be The World’s Smartest Traveler” (National Geographic). You can get real-time answers to any consumer question on his new forum, elliott.org/forum, or by emailing him at wchris@elliott.org.